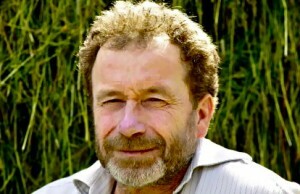 Firmly connected to the cold, often bleak landscapes they inhabit, Per Petterson’s characters are never frivolous, however impulsive and even violent their actions might be. Often shackled by circumstances over which they have little control, they respond in the only ways they can, sometimes self-destructively. The parents of the younger characters can sometimes offer little guidance, even by way of example, and growing up becomes a question of actions followed either by reward or, more likely, by harsh punishment. 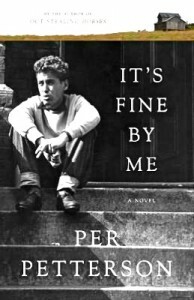 In the ironically entitled It’s Fine By Me, an early Petterson novel from 1992, Audun Sletten shares his life from his teen years to age twenty, always honest in his feelings, sometimes to his own detriment, and always sensitive to his personal standards of behavior, though he often imposes these standards by force. Petterson’s depiction of Audun is lifelike, carefully crafted to allow Audun to maintain the personal respect he believes he deserves, while at the same time, so psychologically revealing of his actions that readers will immediately feel empathy for him and understand his self-destructive behavior. As the novel moves back and forth between Audun as a thirteen-year-old and Audun as a sixteen- or seventeen-year-old, his tendency to hit first and deal with the results later creates problems for him and for others around him. Still, he shows some empathy for others – adults who treat him kindly, and some other, younger children who do not threaten him. Though he punches out the bullying scoutmaster during the one time he joins an organized activity, he allows a young child in his former town to borrow his Cowboys and Indians books, and when that child later goes missing, he is the first to know where to find him and bring him home for help. He beats up a teenager who has bullied him, and then comes close to weeping in class when he reads aloud a story which moves him. Gradually, after many dramatic events, the reader sees Audun beginning to grow emotionally. 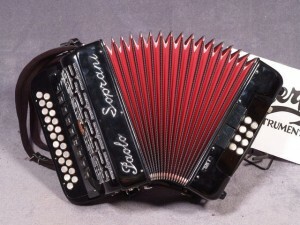 When, at about twenty, Ardun is working at a printing company, he is still very quick to use his fists, but so, too, are many of the people he works with. A few older men take the time to give him some guidance. Always involved with alcohol, he is able to watch a man deteriorate slowly here, and he can actually see that this alcoholic man will, of course, lose his job – the man is unable to control himself, endangers others, and has no other future but to end up living under a bridge, homeless, friendless, and jobless. Beautifully developed and filled with details which ring true, not just in terms of the time and setting, but in terms of psychological honesty, It’s Fine By Me feels autobiographical in its ability to convey real feelings by real people. 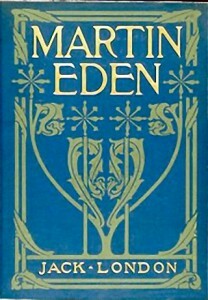 The moving conclusion to this novel shows Ardun’s growth – oft en with the help of those who care about him – and readers who see themselves (at least in some aspect) within the character of Ardun will celebrate his coming of age, all the while knowing that Ardun is a work in progress and that he’ll never be able to take life or his own responses to threats for granted. 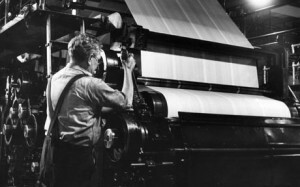 This printing press may resemble the one on which Ardun worked in the 1970s. The description of the drums, blankets, and paper rolls can be seen here.